CAMPO FELICE, Italy — A helicopter ferrying an injured skier off the slopes slammed into a mountainside in central Italy Tuesday, killing all six people aboard in a new tragedy to hit a region already hobbled by a series of earthquakes, paralyzing snowfall and a deadly avalanche. Some of the dead had recently been helping out with the recovery effort from the nearby Jan. 18 avalanche, colleagues said. 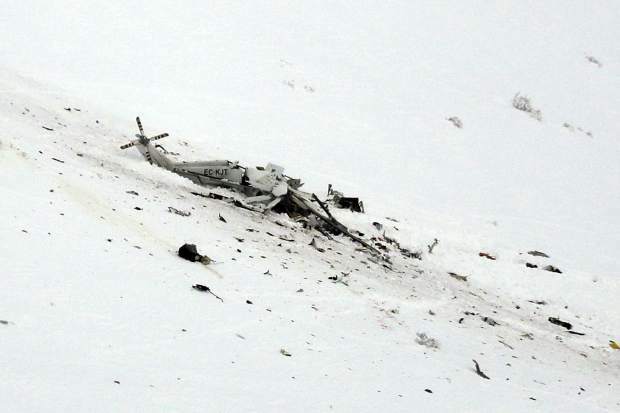 The helicopter smashed to pieces in the snow upon impact, with only the tail propellers and rear section still intact. Rescue crews brought the bodies down in sleds to waiting vehicles. The helicopter was taking the injured skier from the Campo Felice ski area to L’Aquila, the regional capital about 15 kilometers (10 miles) away. The mayor of nearby Lucoli, Gianluca Marrocchi, said he had seen the helicopter and wondered why it was flying so low. “After that it disappeared in the fog,” he told RAI state TV. The area is in Abruzzo’s mountains, about 100 kilometers (60 miles) southwest from where emergency crews have been working around the clock to recover victims of the powerful Jan. 18 avalanche that crushed a luxury resort. Tuesday’s crash was not related to the avalanche, though the mountain rescue crew members involved had been helping with the recovery effort up until Monday, Adriano Favre of the Alpine rescue service, told RAI. DeCristofaro reported from Penne, Italy. AP writer Nicole Winfield reported from Rome.